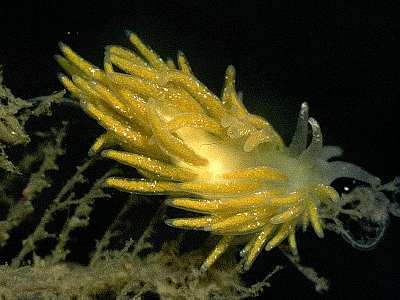 Description: The cerata in this nudibranch are long and thin, giving a shaggy appearance. The digestive gland is normally coloured bright yellow, though this fades to a dull brown in starved animals. There are white pigment spots scattered over the surfaces of the cerata, and the rhinophores have white tips. The tail is long, thin and transparent, but may often be damaged. Grows up to about 18mm in length. Habitat: Feeds on the hydroid Halecium muricatum, which has a yellow main stem. This hydroid is local in its distribution, occurring in scattered exposed localities in SW Britain, W. Ireland, and Scotland. It appears to be commoner in the north of the British Isles, and the distribution of Z. pustulata reflects this. The spawn is a convoluted coil wound round the hydroid food. Distribution: A northern species found as far south as Lundy and Skomer Island in the Bristol Channel, where it may be frequent, and recorded from the English Channel. Long, thin cerata with yellow digestive gland. Scattered white dots on surfaces of cerata. Picton, B.E. & Morrow, C.C. (2016). Zelentia pustulata (Alder & Hancock, 1854). [In] Encyclopedia of Marine Life of Britain and Ireland.